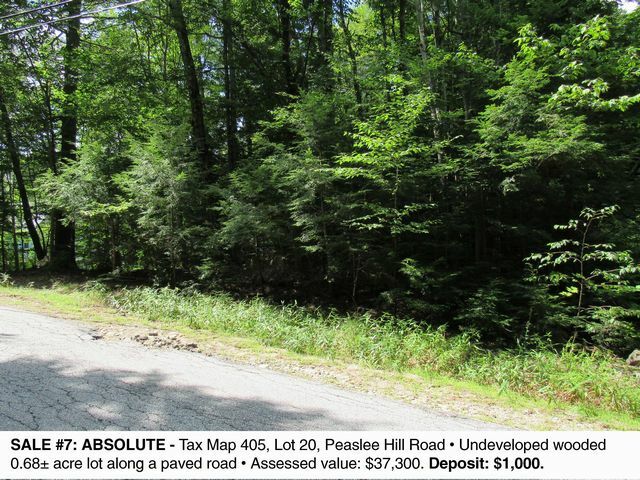 (16) Tax-Deeded Properties in Weare, NH Most to be sold ABSOLUTE! 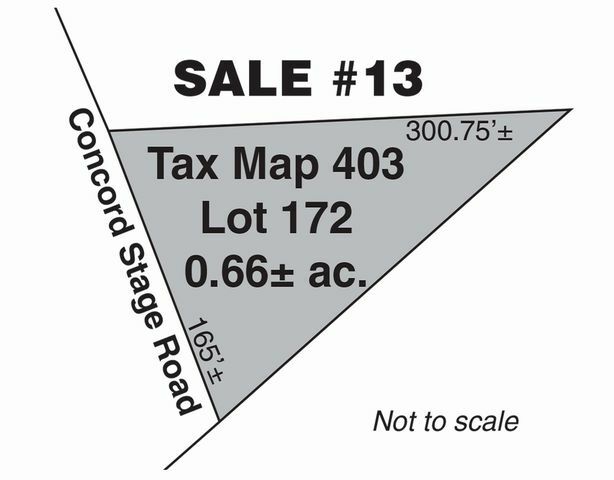 Sale to be held at Weare Middle School, 16 East Road, Weare, NH, Registration from 9:00 AM SALE #1: Tax Map 410, Lot 44, 206-208 Mountain Road * 3-BR ranch, 2-BR cape, garage & shed on wooded 4.41± acre lot * Assessed value: $234,800. 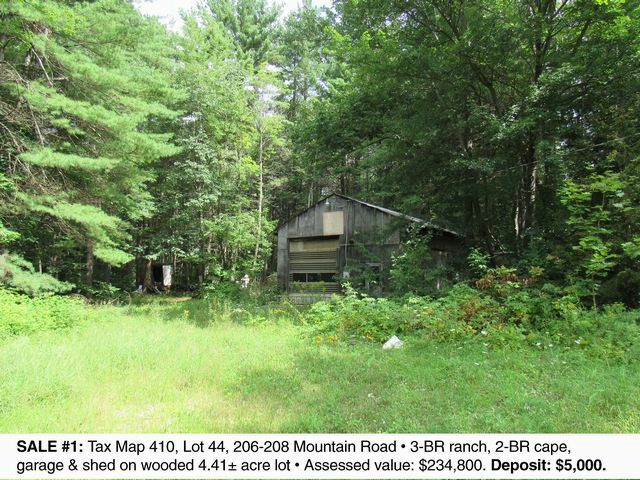 Deposit: $5,000. 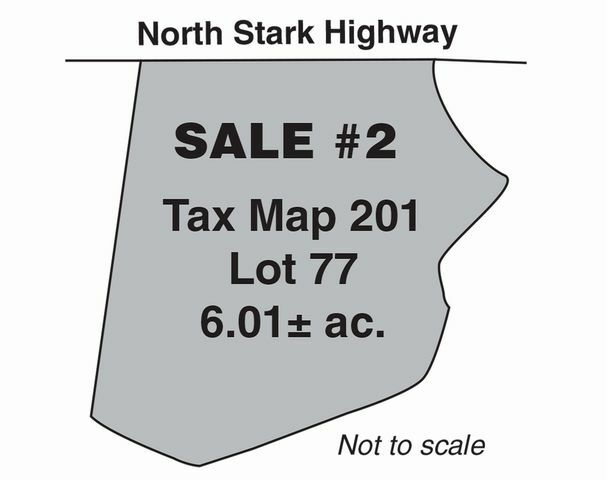 SALE #2: Tax Map 201, Lot 77, 325-327 North Stark Hwy. 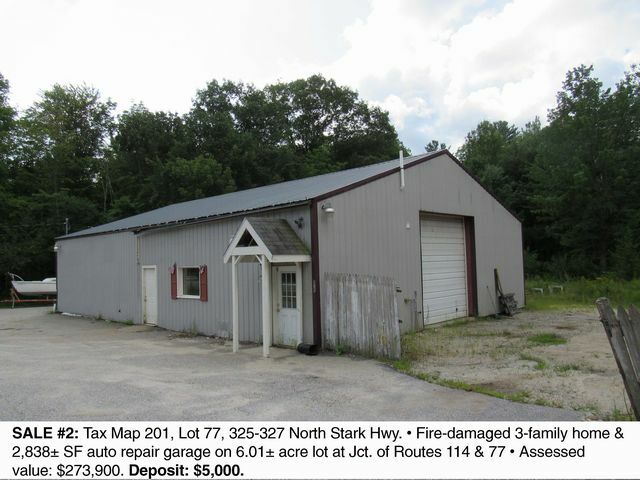 * Fire-damaged 3-family home & 2,838± SF auto repair garage on 6.01± acre lot at Jct. 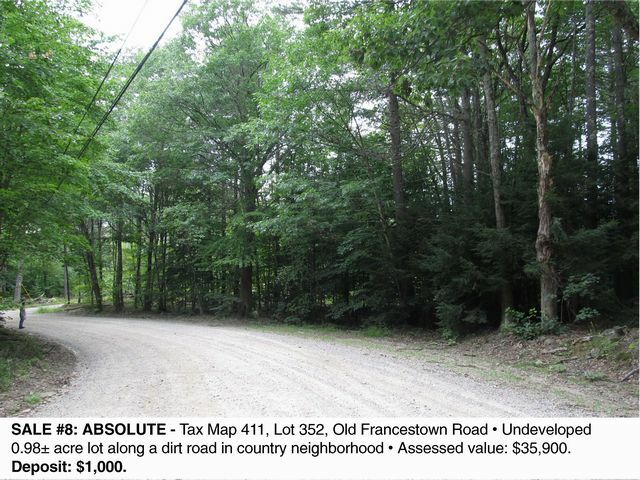 of Routes 114 & 77 * Assessed value: $273,900. 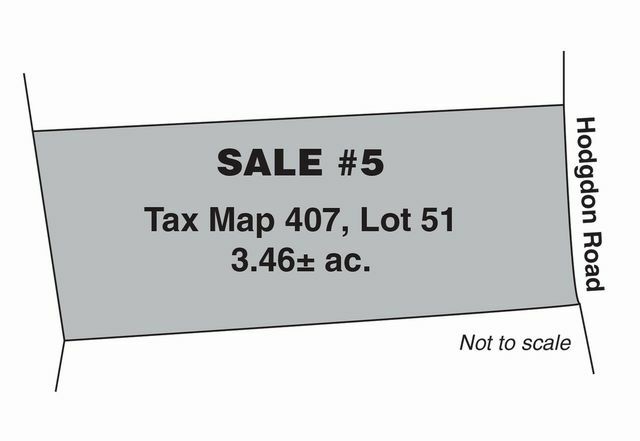 Deposit: $5,000. 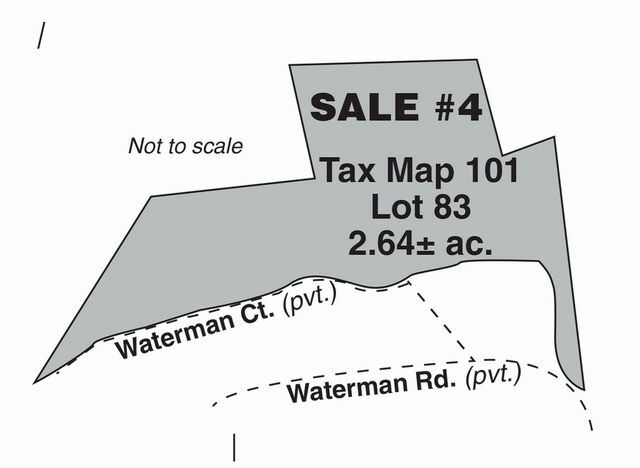 SALE #3: Tax Map 406, Lot 60, 1131 River Road * 3-BR ranch style home with 1-car under garage on wooded 5.2± acre lot * Assessed value: $222,200. 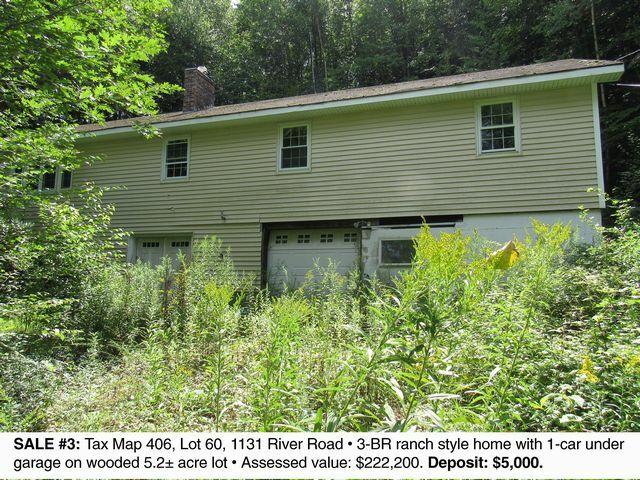 Deposit: $5,000. 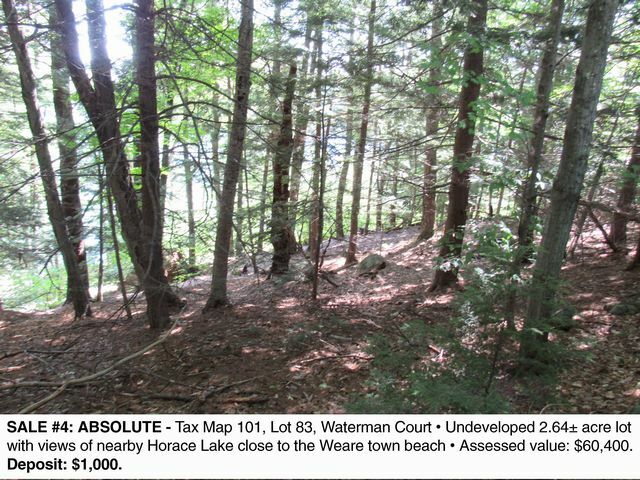 SALE #4: ABSOLUTE - Tax Map 101, Lot 83, Waterman Court * Undeveloped 2.64± acre lot with views of nearby Horace Lake close to the Weare town beach * Assessed value: $60,400. 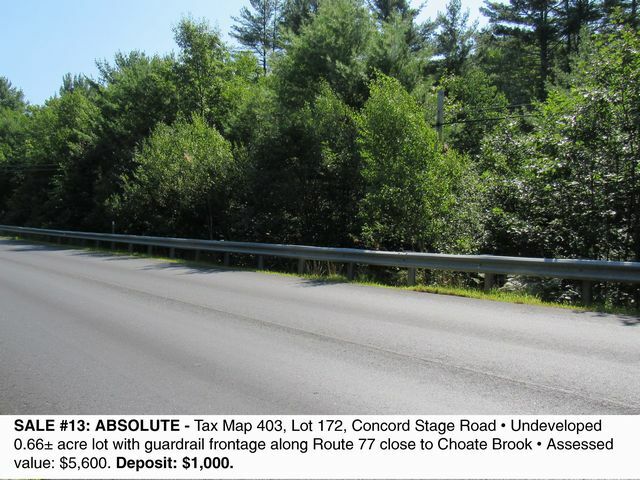 Deposit: $1,000. 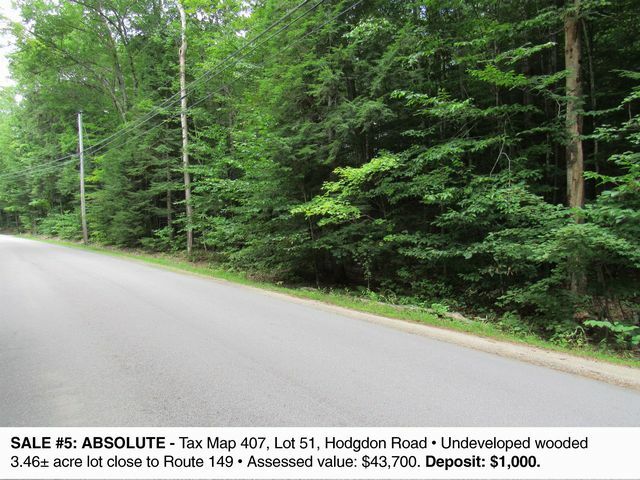 SALE #5: ABSOLUTE - Tax Map 407, Lot 51, Hodgdon Road * Undeveloped wooded 3.46± acre lot close to Route 149 * Assessed value: $43,700. Deposit: $1,000. SALE #6: ABSOLUTE - Tax Map 410, Lot 46, Mountain Road * Undeveloped wooded 2.5± acre lot along a paved road near Perkins Pond State Wildlife management area * Assessed value: $42,900. Deposit: $1,000. 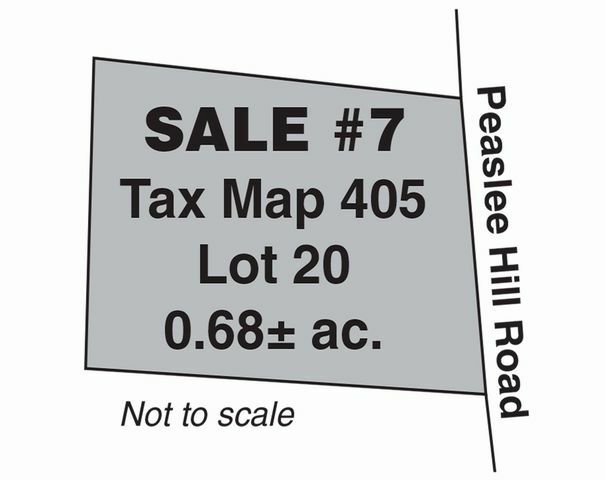 SALE #7: ABSOLUTE - Tax Map 405, Lot 20, Peaslee Hill Road * Undeveloped wooded 0.68± acre lot along a paved road * Assessed value: $37,300. Deposit: $1,000. 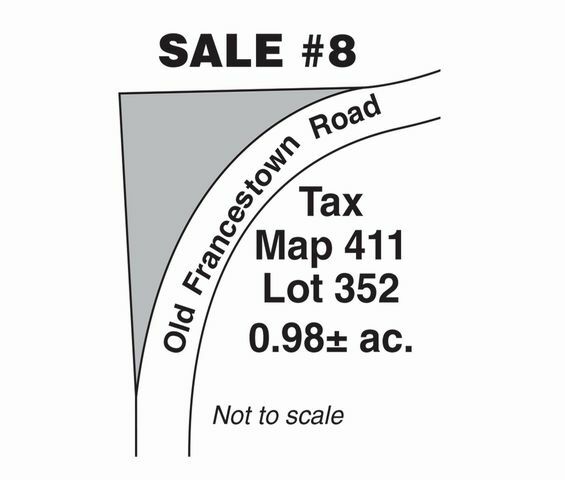 SALE #8: ABSOLUTE - Tax Map 411, Lot 352, Old Francestown Road * Undeveloped 0.98± acre lot along a dirt road in country neighborhood * Assessed value: $35,900. Deposit: $1,000. 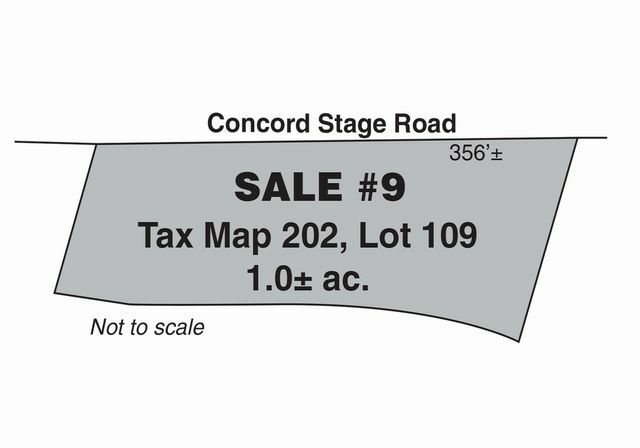 SALE #9: ABSOLUTE - Tax Map 202, Lot 109, Concord Stage Road * Undeveloped Riverfront 1.0± acre lot along Route 77 * Assessed value: $34,000. Deposit: $1,000. 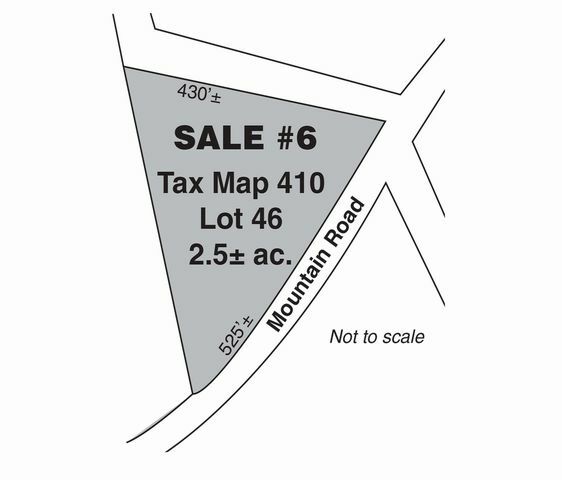 SALE #10: ABSOLUTE - Tax Map 407, Lot 38-106, 194 Buckley Road #106 * 1988 manufactured home with mountain views located on a rental lot in the All Seasons Mobile Home Park * Assessed value: $17,600. Deposit: $1,000. 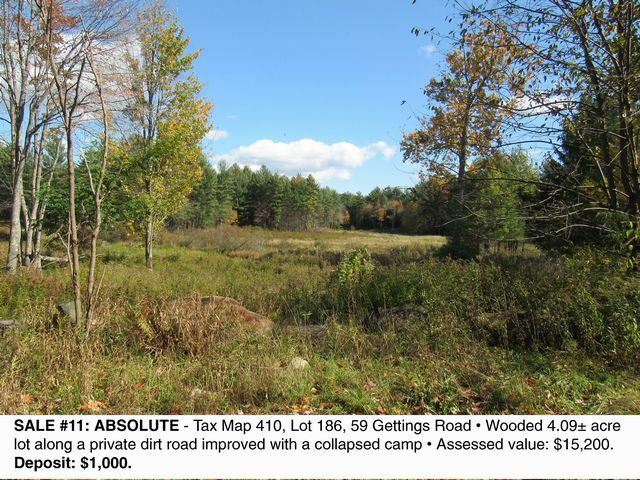 SALE #11: ABSOLUTE - Tax Map 410, Lot 186, 59 Gettings Road * Wooded 4.09± acre lot along a private dirt road improved with a collapsed camp * Assessed value: $15,200. Deposit: $1,000. 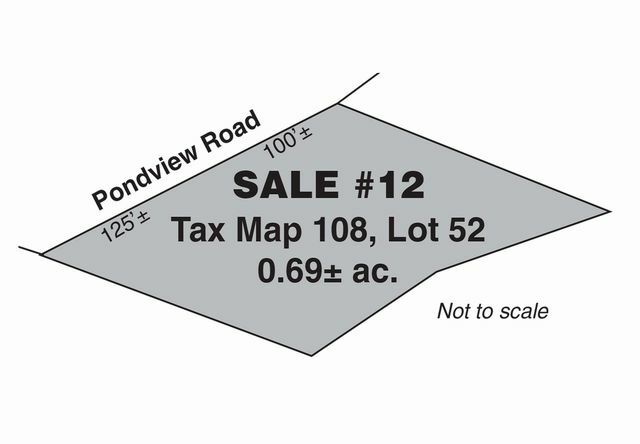 SALE #12: ABSOLUTE - Tax Map 108, Lot 52, 143 Pondview Road * Undeveloped wooded 0.69± acre lot along a private dirt road with water views of nearby Mt. 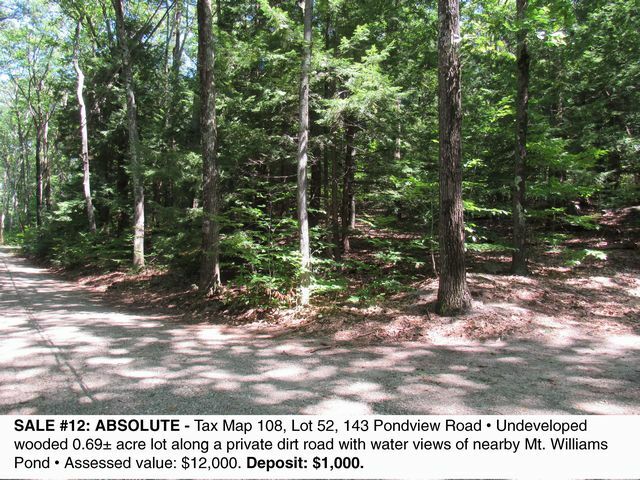 Williams Pond * Assessed value: $12,000. Deposit: $1,000. 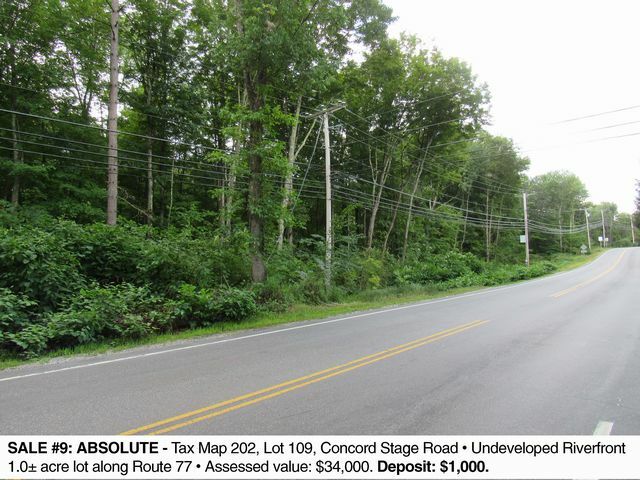 SALE #13: ABSOLUTE - Tax Map 403, Lot 172, Concord Stage Road * Undeveloped 0.66± acre lot with guardrail frontage along Route 77 close to Choate Brook * Assessed value: $5,600. Deposit: $1,000. 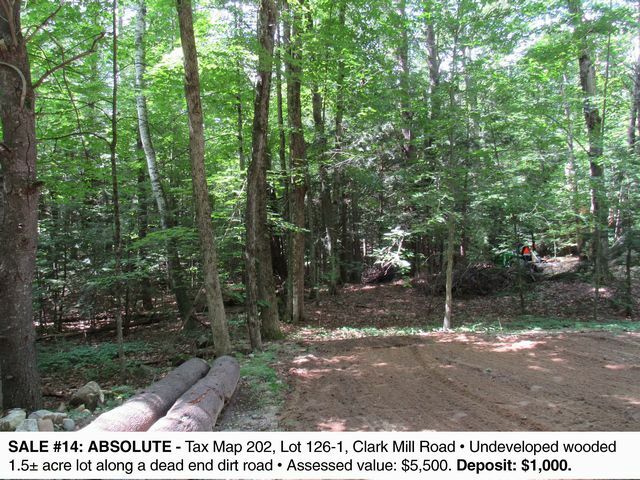 SALE #14: ABSOLUTE - Tax Map 202, Lot 126-1, Clark Mill Road * Undeveloped wooded 1.5± acre lot along a dead end dirt road * Assessed value: $5,500. 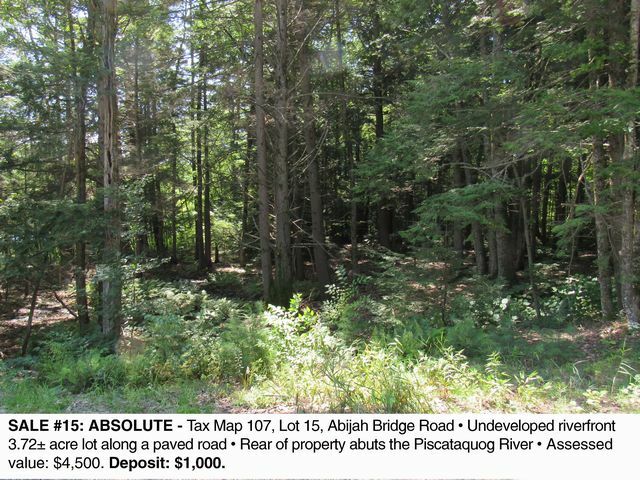 Deposit: $1,000. 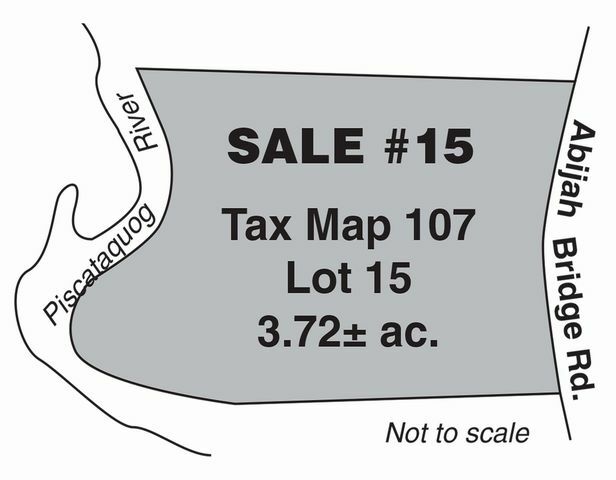 SALE #15: ABSOLUTE - Tax Map 107, Lot 15, Abijah Bridge Road * Undeveloped riverfront 3.72± acre lot along a paved road * Rear of property abuts the Piscataquog River * Assessed value: $4,500. 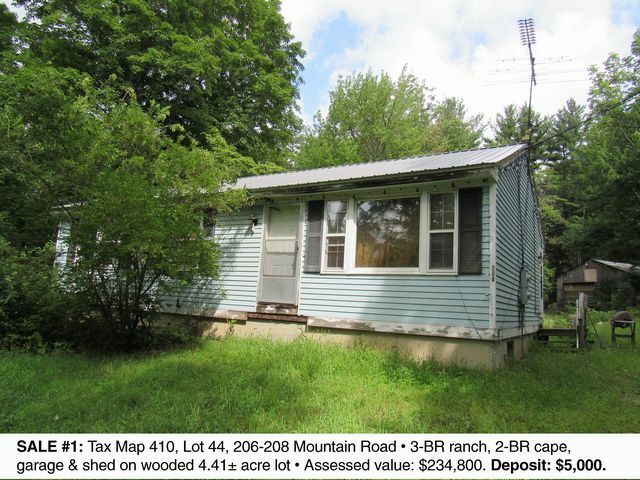 Deposit: $1,000. 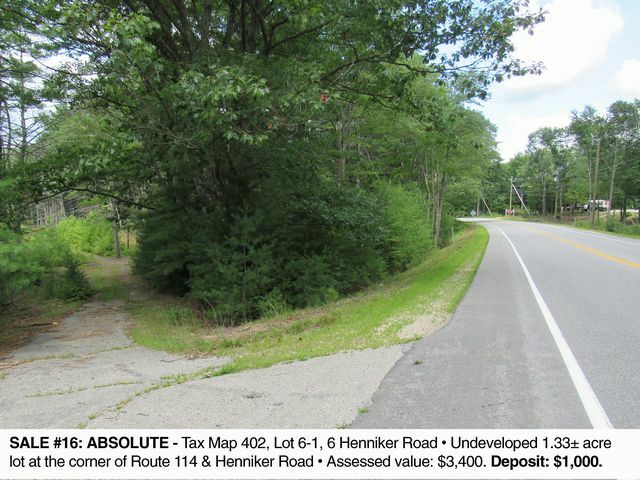 SALE #16: ABSOLUTE - Tax Map 402, Lot 6-1, 6 Henniker Road * Undeveloped 1.33± acre lot at the corner of Route 114 & Henniker Road * Assessed value: $3,400. 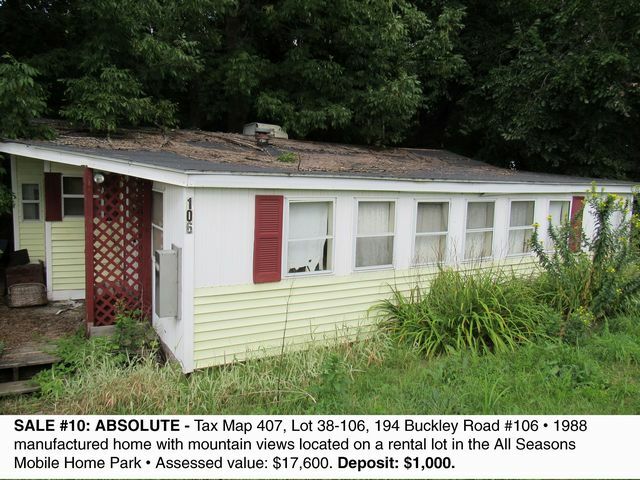 Deposit: $1,000. 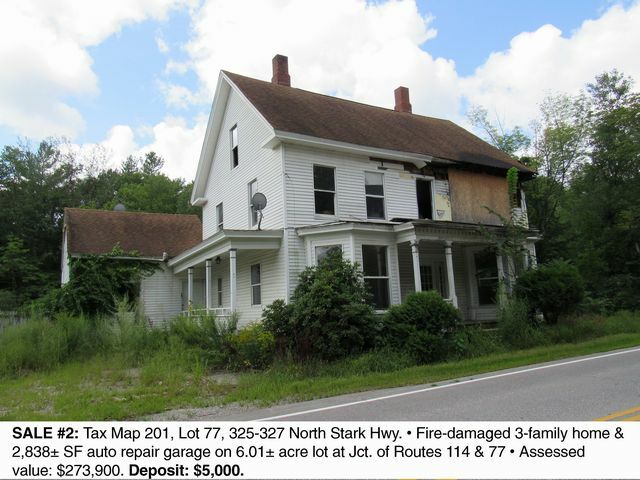 PREVIEW: For Sale #2 (325 North Stark Hwy) - By appointment with auctioneers. 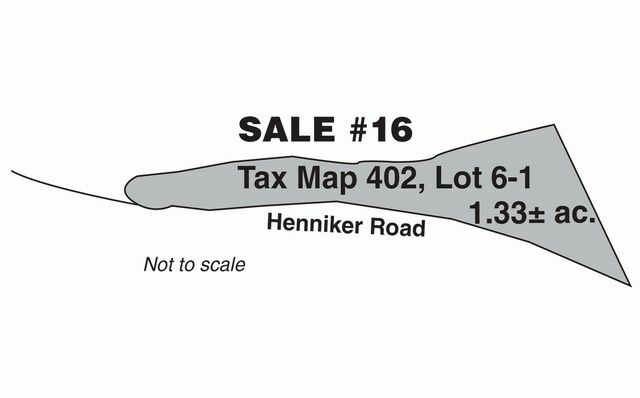 All other sales - Properties are marked; a drive-by is recommended. 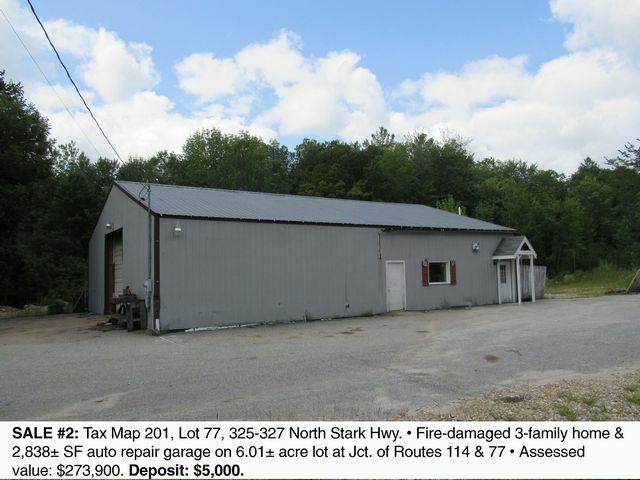 TERMS: All deposits by cash, certified check, bank check, or other form of payment acceptable to the Town of Weare at time of sale. 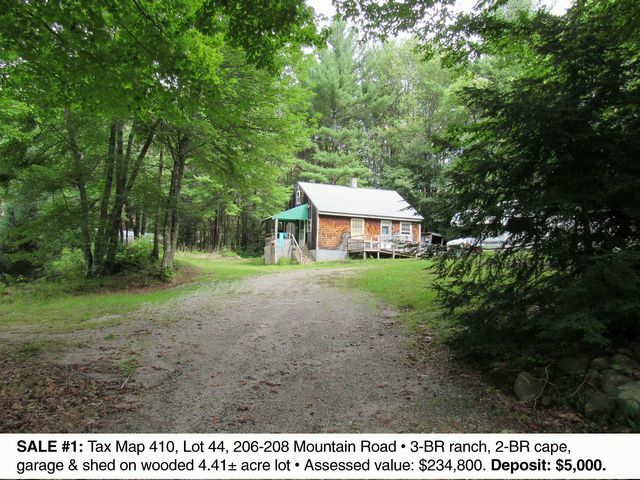 Sales #1 thru #3 require an additional deposit to increase total deposit to 10% of bid price due within 5 business days. 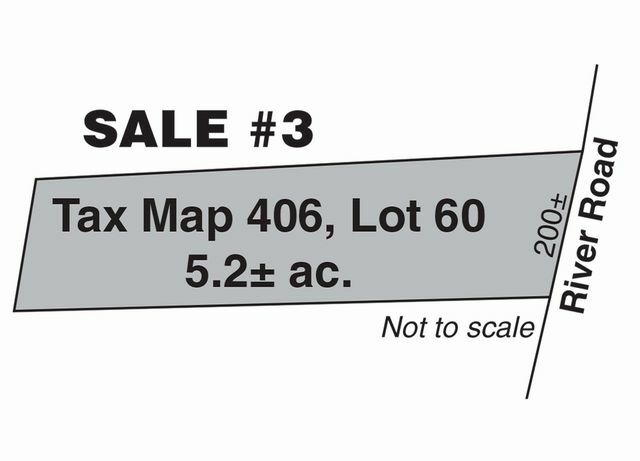 All properties require balance of purchase price due within 45 days after date of sale. 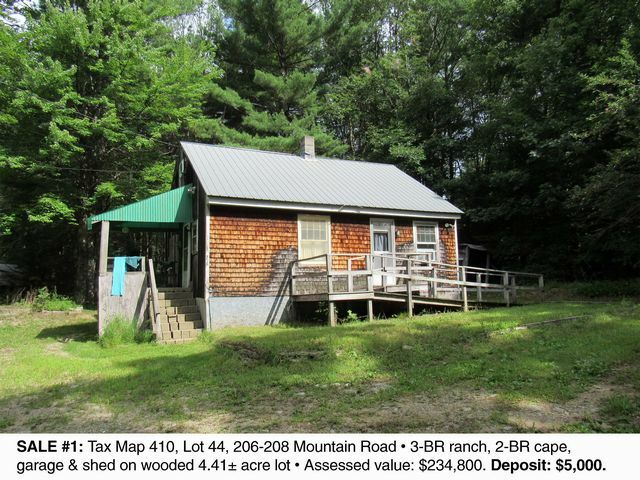 Conveyance by Quitclaim Deed. 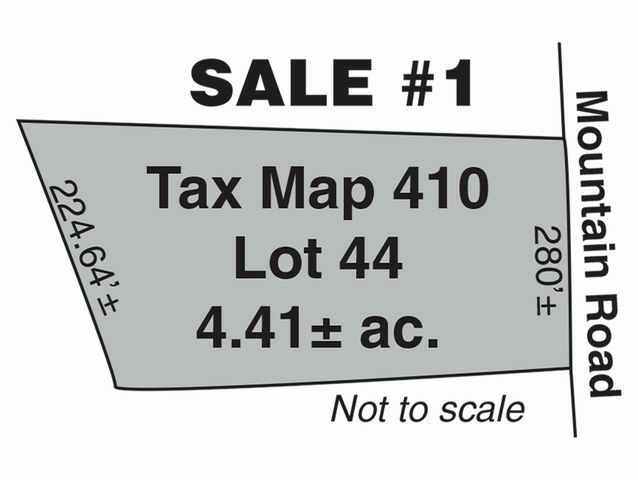 All properties sold "AS IS, WHERE IS'" subject to all outstanding liens, if any. 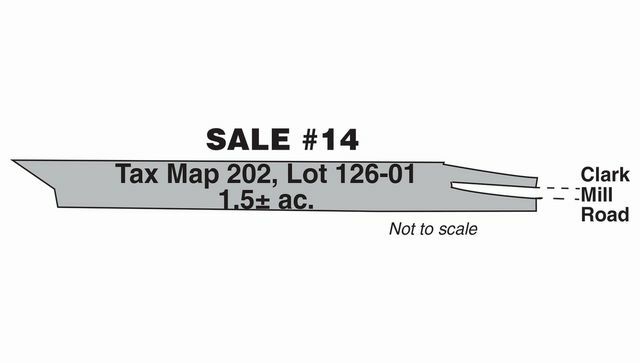 Other terms may be announced at time of sale. 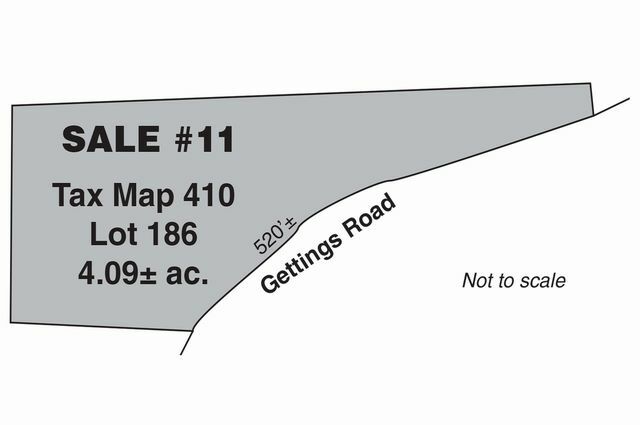 10% BUYERS PREMIUM PAYABLE TO AUCTIONEER DUE AT CLOSING All information herein is believed but not warranted to be correct. 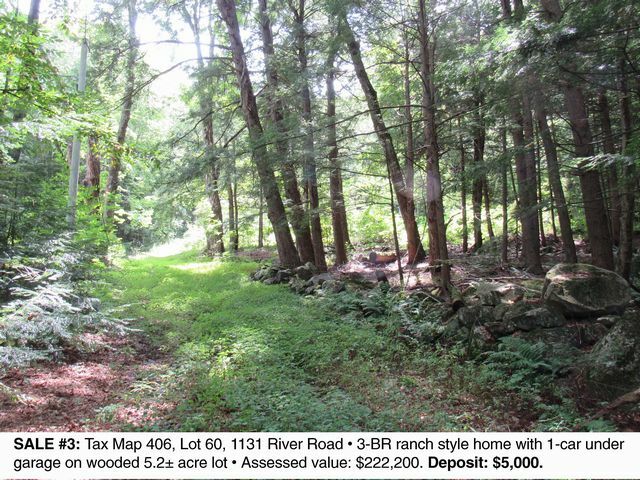 All interested parties are advised to do their own due diligence relative to the buildability/non-buildability of any lot and all matters they deem relevant. 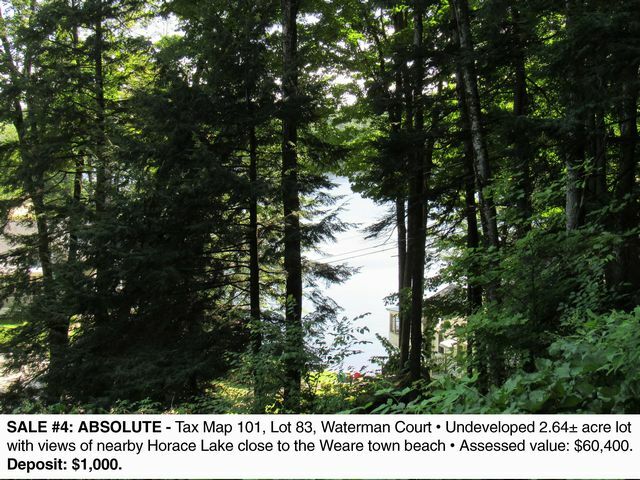 Style/Quick Information: (16) Tax-Deeded Properties in Weare, NH Most to be sold ABSOLUTE!